Our lawn service is not your typical “big box store” approach to turf management. We have three key focal points that lead to our program design: 1) Environmental Responsibility 2) Doing what’s best for the turf, not wallet. 3)Results that speak for themselves. I’ll detail our approach and how it pertains to our focal point. Environment responsibility is a hot issue. Between GMO crops, Antibiotics, and Hormones, it’s in our face more so now as a consumer than ever before. Our industry is often mentioned in these topics because we use herbicides, pesticides, and fertilizers. Specific to our industry you hear of runoff, drift, leaching, phytotoxicity, and resistance. It is our responsibility to address these topics and react accordingly. Proper application techniques can help solve most of the issues. For instance, utilizing proper rates, nozzles, and pressure can minimize drift. So there are solutions to many of these charges. The first impression for the lawn is from the road, at a distance. What is the color? Is it green? is it uniform? How is the height? Too tall? Too short? How many weeds are in the lawn? In what condition are the neighbors’ lawns? This can tell us many different things. For instance, poor color could be a symptom of low fertility. Patches of declining turf could be a disease. High numbers of weeds could indicate improper cultural practices or even bare areas. So it’s important to assess the total picture. The lawn in the picture is an example of misapplied fertilizer. 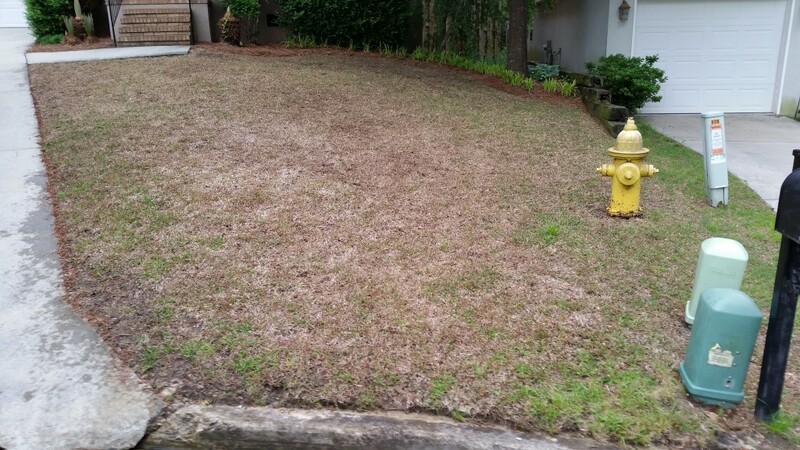 This is why your lawn service provider should be knowledgeable and skilled in turf management practices. 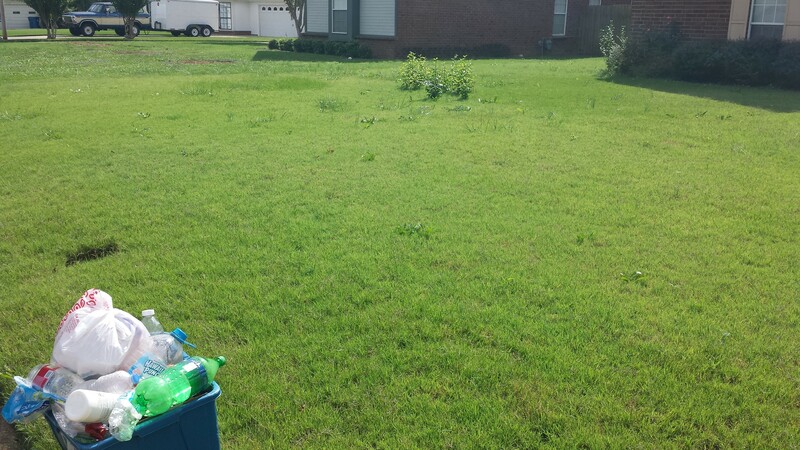 This photograph demonstrates high weed pressure, in frequent mowing, and generally poor color due to improper nutrition. 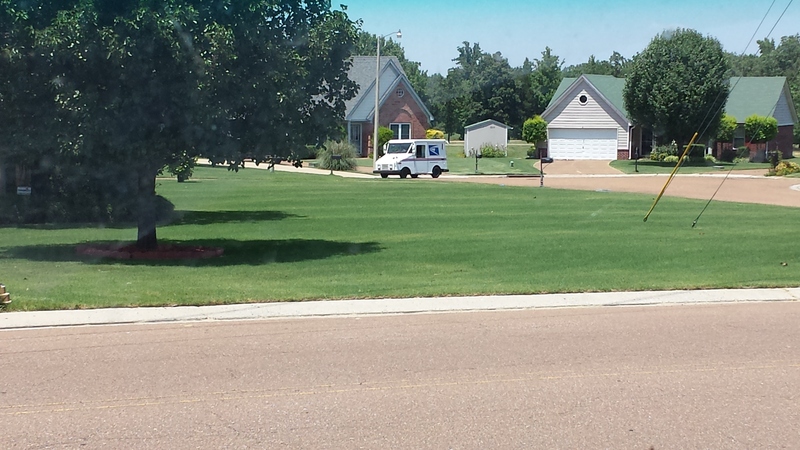 Lawn care operators should have an eye for seeing problems. Whether it be color variations or dead patches, a keen operator will bring these issues to light. 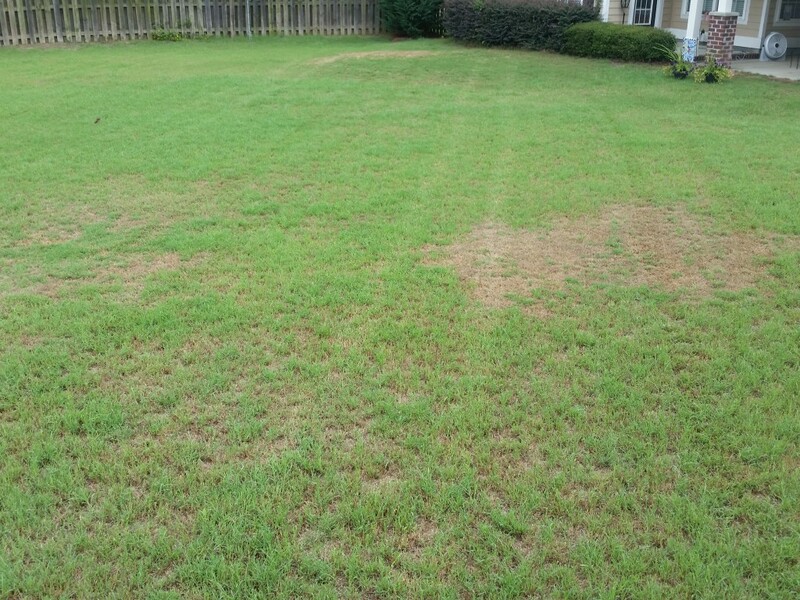 It is important to not only identify the lawn issue, but let the customer know what’s taking place. Even with many years in field experience, there are many problems that still require research. It is important for me to communicate with the customer exactly what’s happening in the lawn. Being able to correctly identify the issue is of the most importance. An incorrect diagnosis can either slow or prolong recovery, or worst case scenario, cause more damage. It’s important, no matter how certain of an issue, to read, research, and identify the clues the plant are giving you to determine accurate diagnosis. 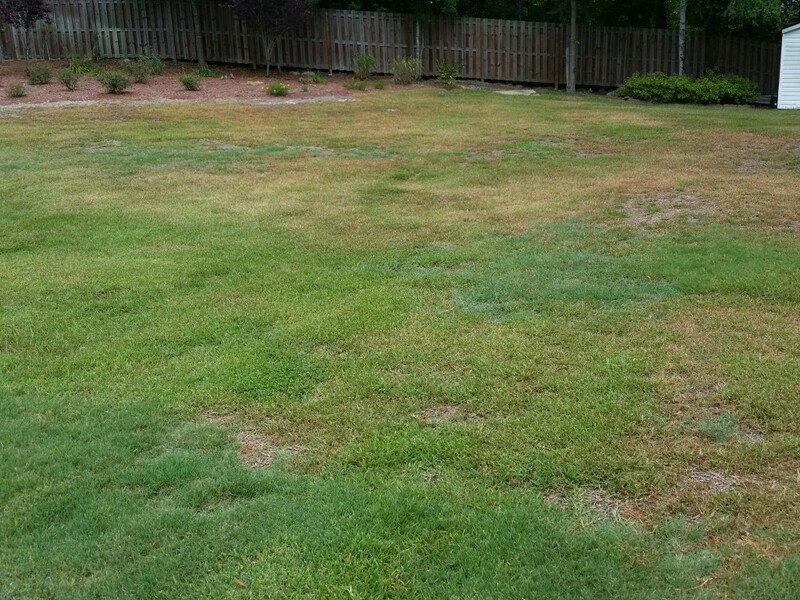 This picture shows a common bermuda & St. Augustine lawn lawn with cinch bugs. From a marketing stand point, many lawn service companies develop a program. Here at Outdoor Designs, our full lawn service program consists of 7 applications. I usually have an idea of what I’m going to put on a lawn for each of those 7 applications; however, often times that can change. For instance, brown patch outbreaks may require a fungicide instead of a weed control. Maybe severe tunneling will require a grub control versus a fertilizer. By being on the lawn seven times throughout the course of the year, it is easier to catch such issues sooner and work towards correcting them. Ultimately what it comes down to is delivering results. If the results can’t be produced, expectations can’t be met, and customers cannot be made to feel satisfied with their investment. Experience, knowledge, and know how all come into play and with out it, the lawn can be left to suffer. Here at Outdoor Designs, we guarantee experience, knowledge, and the know how to make your lawn the envy of the neighborhood. It’s time Knoxville embraces greener, cleaner, smarter lawn care. Epsom Salt… To Save Your Lawn?